Last year I was introduced to the amazing work of Brian Pendergrass, Russ Maxwell, Brent Groom and Eric Dixon in the form of the SRx Core the SharePoint Search Health Reports. This suite of reports was created to help evaluate, monitor and maintain on-premises SharePoint farms by providing DEEP feedback and analysis of the SharePoint Search Service Application. The core is a set of “tests” that you can run collectively or independently and in detail to determine the overall health of your SharePoint Search Service Application (SSA). This will build a local cache and do some initialization of the object needed to run the reports. Now you should begin to get an idea why I am so excited about these reports. They are beyond simple “point in time” status reports. They provide an insight into performance and optimization tweaks that you can make to your environment to gain the maximum performance possible from your SharePoint SSA. For example, the OSPowerPlan test evaluates that the Servers in the Search Topology are all running in “High Performance” mode. The OSVolumeProperties test evaluates that the drives used by the Index are formatted correctly and not using compression or native indexing which will hinder performance of the SharePoint indexing process. You can review the details of all the tests here. Summary for each test. There are a ton more reports than these tests, too. I hope to go into more detail about them in future articles. As you look at the summary of test results you will notice that Normal, is good (because it’s green…). Warning may be a cause for concern. Your goal is to eliminate the warning indicators through configuration and management of the Search Topology. You can begin this process by running more detailed reports for each test. This can be done in two ways, you can either use the -Details flag when you -RunAllTest though I think that’s a bit hard to process. So, the meat of the script just takes the result object and then sends it to Excel (thanks Ben) or to SQL. 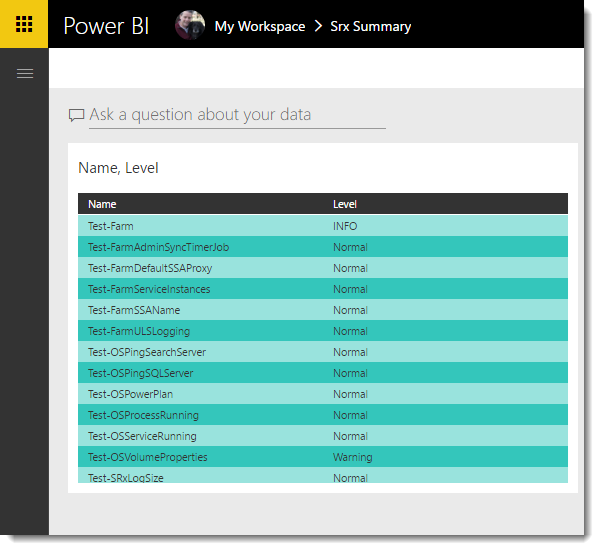 In PowerBI, on the web, I can view the summary report and ask questions about it. Using the PowerBI App I can monitor the report and set alerts in the event the data changes. So, there you have it, one approach for creating the beginning of what could easily become a complete dashboard solution for your SharePoint Search Service Application. Ben does some great demos of Site Collection and Content Database reporting too, you should check out his sessions in Orlando later this year. Since this is what I call a “Franken Project”, I have created a GitHub Repository for the full scripts, but you will need to download the Srx Reports and Ben’s project separately. The instructions for the directory structure are included in my project. I also included the SQL script to provision the Azure SQL database used in this demo. OK, that it for this initial post. I plan to continue to decorate the dashboard with additional reports. I would love to see how folks use this approach to monitor and manage their Search Service Applications. Nice work. Noticed a typo ” .\InirSRx.ps1″ should be “InitSRx.ps1”.